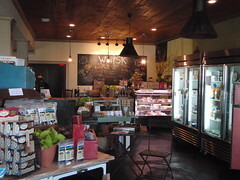 Gretchen buys meat, fresh vegetables, ginger, cereal, chicken, sausage, and bacon at Whisk Organic Market in Valdosta. Also Newman ginger cookies. She says Gracie says people who come in often don't understand organic fruits and vegetables aren't always the most beautiful ones. But they're tasty! Here's a playlist of videos of proprietor Gracie Crane Douglas talking about her store. Pictures and Videos by Gretchen Quarterman. 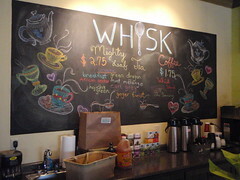 More pictures of Whisk Organic Market in a flickr set.